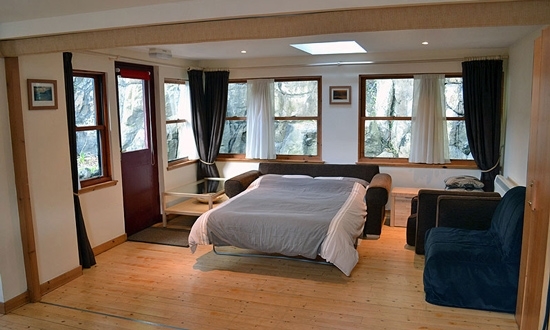 This self-catering holiday cottage is in Tobermory, the main town on the beautiful Scottish Island of Mull. The house is known as 'the old chocolate shop' and is situated behind the famous Mishnish buildings on colourful Main Street. 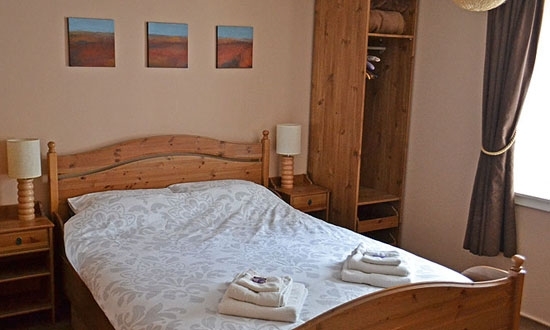 Situated in the heart of Tobermory, Back Brae Lodge offers easy access to the local Co-Op, arts and craft shops, a bank, museum, post office, a handful of public bars, a range of restaurants, an arts centre... and many other interesting corners! Sleeping accommodation comprises one main double bedroom with two sofa beds within the upper floor living area. Three-night Weekend Breaks run from Friday afternoons to Monday mornings. Four-night Midweek Breaks run from Monday afternoons to Friday mornings. These short breaks are normally only available during the off-peak season between September and April. Seven-night peak season Full Week stays run from Friday to Friday. These are available from May to August. See the Full Bookings Diary or the Available Stays list. The property is completely non-smoking, however there is an outside decked porch area with chairs and table. Please note that there is one short flight of steps up to the lower entrance, another flight to the upper entrance, and an internal staircase between the floors. Original artwork in the house is by Shelagh Boyle and Ronnie Leckie. The property is heated by electric storage heaters, with additional convector heaters in the lower bedroom and upstairs. There is an under-counter fridge in the kitchen, and a separate small freezer. Hot water is supplied by a timed electric immersion tank. There are fire alarms and extinguishers throughout the house. Downstairs, there is an iron & ironing board, electric tumble dryer, a drying pulley for clothes, towels and linen and a hair dryer. Toilet roll and bathroom & kitchen cleaning materials are provided. In addition to the main bedroom with kingsize bed, there are two sofa beds (small doubles) on the upper floor. You may use many combination of these spare beds if you require them, but please remember that the maximum occupancy of the house is three adults. For comfort, one adult per sofa bed is recommended. There is also a travel cot in the house for babies - you will need to bring your own soft bedding for this. A hand towel, face towel and bath towel are provided - bring an extra large bath towel if you prefer to use these. The kitchen features a breakfast bar and includes a dual oven and grill, ceramic hob, microwave, washing machine, dishwasher and fridge. There is a range of pans & utensils, and tea towels, laundry washing powder and dishwasher tablets are provided. The dining table seats up to six people. There is usually a small supply of tea, coffee and powdered milk in the kitchen for your arrival. There is a 32" LCD digital television and DVD player for your use. This provides NetFlix, Amazon Video, BBC iPlayer and other on-demand entertainment. Playing cards & board games on hand include Trivial Pursuit and Scrabble. There is Wi-Fi wireless (and Ethernet wired) access for your laptop or mobile phone. There is no limit on usage. The usual download speed is 37Mbps and upload 9Mbps. Outgoing UK landline and mobile calls are FREE from the landline telephone supplied. There is a 1571 answering service on the phone where you can pick up messages. The mobile phone signal in the house is good. There is a diverse collection of books and maps to borrow, including guides and histories of the local area and Scotland. Your bicycle, canoe, surfboard or similar item can be stored either in the lobby or outdoors, behind the house on the decking. The risk of theft is very low, but remember your own locks if you prefer to secure your belongings outside. We regret that dogs or other pets are now strictly not allowed at Back Brae Lodge. Some dog owners in the past didn't respect our rules about restricting dogs from soft furnishings, and in these cases we didn't feel confident in maintaining the highest standard of cleanliness for following guests, during the time available for changeovers between stays. 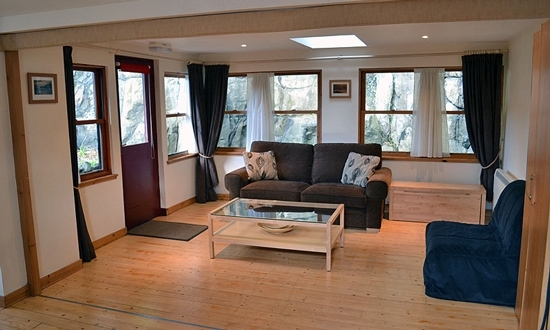 Back Brae Lodge is an open-plan residence furnished to a high standard. The spacious L-shaped upstairs room combines the living area, dining area, kitchen and extra sleeping space. The upper floor space can be blacked out with the curtains and Velux blinds. There is a sliding wooden door partition which can be pulled across to split the room if necessary. The lower floor of Back Brae Lodge is accessible through both the internal staircase and a separate lower entrance from outdoors. It comprises a lobby and drying room, bathroom and double (kingsize) bedroom. Back Brae Lodge sits by the rock face which surrounds the natural harbour of Tobermory on all sides. There is an outside decked area with table and chairs for your use. On good days, this is at the sunniest from mid-morning to mid-afternoon. You can get your groceries and most other essentials in the Co-Op supermarket, 2 minutes' walk on Main Street. Another useful nearby shop is the legendary Brown's hardware store, well known as an "Aladdin's cave"! See a list of all shops on Main Street.